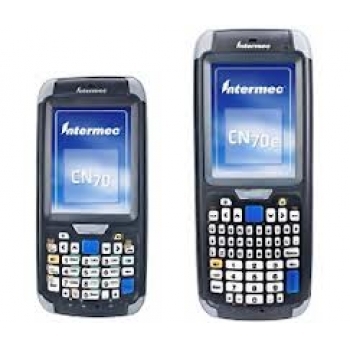 Every 70 Series mobile computer comes pre-loaded with Intermec's ScanNGo client to provide a premium device provisioning experience to simplify and expedite device staging operations. The standalone ScanNGo client enables CN70 and CN70e users to provision, configure and automatically download application software even over WWAN in a matter of seconds rather than minutes by simply reading pre-configured bar codes. Today's mobile worker is in a race against time and needs to get the job done right – right now. Spotty wireless coverage, weather extremes, damaged barcodes, dimly lit trucks, and heavy device wear and tear are the reality of their day. The CN70 and CN70e meet these challenges head on with next generation features that save valuable seconds and deliver unparalleled reliability. Intermec's high performance imager provides optimal bar code scanning capabilities even in low light scanning environments and unmatched motion tolerance and laser aiming for the snappiest speeds. These features eliminate costly delays in scan intensive applications. Protecting your company's revenue stream as well as finding new revenue sources is the lifeblood of staying competitive. Intermec's application development resource kits enable you to leverage data from the GPS radio, 5 megapixel auto-focus camera, bar code imager and sensors in innovative ways to develop new services and insights to your field operations. The CN70 and CN70e mobile computers' unique device health reporting capability provides insight never before available to allow mobile workers and IT administrators to monitor and prevent issues before they impact operations. Key sub-systems, including scanning, communications and battery life, can be monitored by either the mobile worker via an on-board dashboard utility or remotely through the Intermec SmartSystems™console, resulting in better utilization of your mobile computing assets. For customers who want a trusted partner to take over the day-to-day task of managing and troubleshooting their mobile devices and wireless infrastructure, Intermec's Intermec's INcontrol managed servicesportfolio offers flexible, integrated mobile device and wireless network management services via a hosted web based tool set. Through INcontrol, technical experts from Intermec or one of its qualified PartnerNet members assume these tasks, allowing customers to track assets, secure network investments efficiently, and achieve a lower total cost of ownership (TCO).